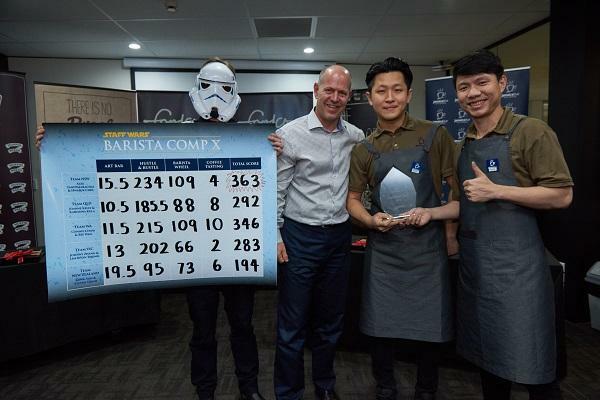 Foodco's 10th Annual Barista Competition finals were held in Sydney with the cream of baristas from across the nation invited to participate. Two finalists from each state were selected from 340 baristas across Muffin Break bakery cafés and 83 from Jamaica Blue cafés. The competition was hosted at Foodco’s Centre of Retail Excellence (C.O.R.E), an innovative state of the art training facility open for all franchisees. C.O.R.E consists of a retail outlet (open to the public) as well as a coffee training room, training kitchen and a classroom environment. Franchisees attend for three weeks as part of their initial induction to learn first hand practical skills of coffee making, food preparation and Foodco business systems to support in creating a profitable store. The C.O.R.E program is a recognised accredited Certificate 3 in Hospitality so franchisees are able to gain a qualification on completion.